Whoa! What was that? 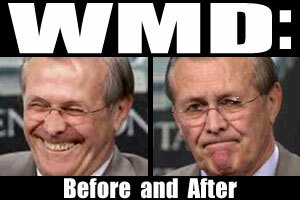 Maybe Saddam destroyed the WMDs before we got there? Isn't that what Saddam claimed all along? So Slimeball Saddam was telling the truth and Shrub was lying? The irony of the administration asking for more time to find the WMDs when it denied that time to the UN inspectors would be delicious if it were not for the disgraceful nature of all those lies. If a Democratic president were ever reckless enough to put the country in such an embarrassing position there would be a 250 million man lynch mob surrounding the White House. During this last week several news reports have surfaced about administration officials distorting intelligence briefs to support their political agenda. A recently retired State Department analyst, Greg Thielman, said "There is a lot of sorrow and anger at the way intelligence was misused." He added that he couldn't believe that Bush would use "that stupid piece of garbage" about Iraq buying uranium from Niger, referring to the poorly forged documents the US presented to the UN as proof of Iraq's nuclear naughtiness. This revelation should come as no surprise, at least to members of the online progressive community. The White House propaganda about aluminum tubes, Nigerian uranium, Iraqi defectors' testimony, and unmanned drones was debunked long before the invasion began (See An Angry Liberal, 3/10/2003). The frustrating thing about these lies is not that they were so easily disproved, but that the administration kept on telling the same lies after they were exposed and that the American corporate-controlled media continued to repeat them virtually unchallenged. The administration's propaganda strategy appears to be based on the idea that the American public is ignorant, uninformed, apathetic, and incapable of remembering last month's propaganda. That's just plain insulting. On the other hand, if they get away with it - they'll be right.